Note that km-config only installs the keyboard into IBus. 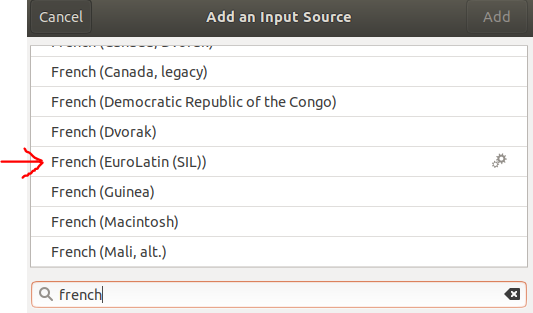 The step to “install the Input Source in Region & Language Settings.” is needed for it to be used in gnome-shell. 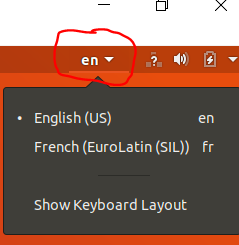 https://help.gnome.org/users/gnome-help/stable/keyboard-layouts.html.en is the Gnome instructions for adding an input source. The first time I got to this point, Settings froze up and I had to terminate it and start over. The second time it worked, bringing up a long list of languages. I typed in “french” and scrolled to the “French (EuroLatin (SIL))” entry. Just some general questions/feature requests (I haven’t try version 11, as am still familiarizing with version 10). Is there any automation tool to test a list of keystrokes? Because I have a complex keyboard and when I changed something I want to make sure it still correct for the rest of the stuff that I tested correctly before. Is it a bug that I cannot do a redo (Ctrl+Y), or is it on purpose? I can do Undo (Ctrl+Z), but redo doesn’t seem to work. It seems that the keyboard rules only work if someone typed it in succession. In other word ‘a’ + ‘b’ > ‘c’ would work if typed in succession, but if I type ‘a’ and go to another line, and go back to ‘a’, typed ‘b’, I would get ‘ab’. So it doesn’t look up what’s the character before, if it’s not typed in succession? Thank you for the excellent program. but if I type ‘a’ and go to another line, and go back to ‘a’, typed ‘b’, I would get ‘ab’. So it doesn’t look up what’s the character before, if it’s not typed in succession? Contexts (and deadkeys) are intentionally cleared when navigating to different lines. To clarify this a little: modern applications, such as Microsoft Word, that fully support the Text Services Framework, have the ability to report the context to Keyman so contextual input is maintained when moving around the document. Deadkeys are always cleared when location is updated, as they are ephemeral state markers. Keyman Developer does include a ‘regression testing’ tool. It is in need of some tender loving care as it is getting a bit old, but it does still work. We plan to introduce more robust and extensive unit testing for keyboard layouts in a future version of Keyman Developer. If you would like to suggest this as a future feature, please visit https://github.com/keymanapp/keyman/issues/new/choose. Sounds like a weird issue. Glad it’s gone away … but let us know if it recurs! Thank you everyone for your feedback. We’re closing this thread now that Keyman 11 is released. You can continue to provide feedback in new posts.